Structural Design Concepts, Inc. specializes in equestrian building design services. Our team of engineers can design even the largest of clear span spaces. Our engineers will make your equestrian dreams a reality. 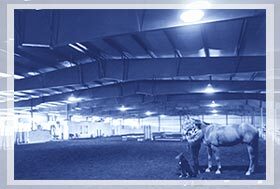 Large buildings such as riding arenas involve complex design calculations to evaluate the stress on every inch of the structure. Stamped erection and foundation drawings.